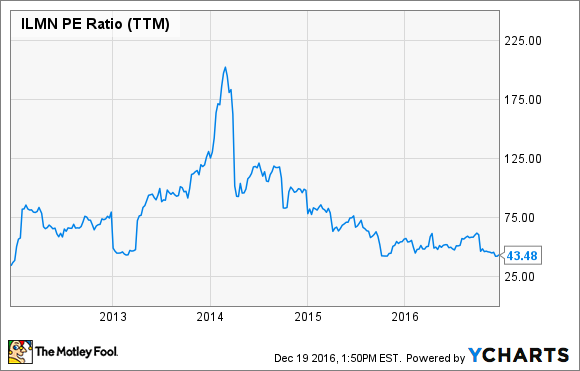 Illumina Has Dropped 32% in 2016 -- Is the Bottom Finally in Sight? It's been a rough year to be an investor in the genetic-testing equipment maker. Are we finally nearing bottom, or could there be more pain ahead? The past 12 months haven't been kind to investors in Illumina (NASDAQ:ILMN). Shareholders of the genomic-sequencing equipment maker have endured a sickening decline of more than 33%, which vastly underperforms both the broader biotech industry as well as the S&P 500. Is the future finally looking up for shareholders, or could the slide continue from here? Let's take a look at the year's key developments to figure out which is more likely. Illumina got off to a bad start to the year mostly because of the general sell-off in the biotech sector. Shares quickly bounced back, but then an underwhelming first-quarter earnings report caused shares to dive again. Thankfully, the company's stock got its mojo back from an upbeat second quarter, allowing shares to nearly fully recover by mid-October. That's when the wheels fell off the bus. Illumina surprised investors by announcing that its third-quarter revenue would come in around $607 million, which fell below its guidance range of $625 million to $630 million. Shares plunged more than 24% in a single day when the news broke, sending them to their lowest levels of the year. CEO Francis deSouza blamed the revenue shortfall on disappointing sales of its high-throughput systems. Worse yet, management stated that revenue in the fourth quarter wasn't likely to pick up the slack. The dismal forecast caused many analysts to reevaluate the company's prospects. Some analysts are even projecting that Illumina's weak numbers will persist for several more quarters due to increased competition from companies like Thermo Fisher Scientific. That fear has led to several price target revisions, further weighing down the company's stock. When you combine the barrage of bad news with the stock's premium valuation, it is easy to understand why Illumina's shares have been under pressure all year. Despite all the doom and gloom, there are reasons to believe that the selling pressure could be nearing an end. First, while Illumina did miss on its third-quarter revenue guidance, it only came up 3% short of its forecast. In addition, the $607 million in revenue still represented double-digit growth over the third quarter of 2015. Illumina's non-GAAP EPS of $0.97 was also much better than the $0.87 that analysts were expecting. While these figures are a bit disappointing, they do not imply that the company is falling apart. Since the close of the quarter, we have analyzed market and funding dynamics, capacity utilization, competition, and outsourcing trends. Based on these reviews, we do not believe that excess market capacity, outsourcing, or competition materially affected our results or outlook. He also later noted that the company's win rate continues to hold steady. That implies that Illumina continues to have a leg up over competitors. Third, Illumina continues to invest heavily in its future. The company's two moonshot initiatives -- Helix and Grail -- offered the potential to open up a $100 billion market opportunity. While we are still years away from that happening, these projects do provide investors with a reason to remain optimistic. Finally, while Illumina's trailing P/E ratio of 43 isn't classically "cheap," it is one of the lowest valuations that shares have fetched over the last few years. Have we reached a bottom? While it would be small "f" foolish to call a bottom in any growth stock that still trades at a premium valuation, I can't help but feel that the market's reaction to Illumina's 2016 might be overdone. After all, Illumina is still the top dog in an important and emerging industry, and if Helix or Grail pay off, the company's future could be extremely bright. Still, it is notoriously difficult to value growth companies that promise game-changing technology, so I could easily see plenty more volatility ahead. If you are bullish on Illumina today, the smart move might be to open up a small position and then add more on any future declines.